Instead of using 2 or 3 builder’s skips, why not have one container? Roll on Roll of containers are for sites with bulk waste requirements, where a skip just isn’t big enough. Hiring a Ro-Ro couldn’t be simpler. Either use the below or simply call 01253 89 20 20. If you feel there may be an issue please do call for a quick chat to ensure your booking the right size for the job. Low-sided and ideal for inert type wastes such as mixed construction, soil, rubble and hard-core. The majority of councils will not allow these containers to be placed on public highways. This container has a weight limit of 15 tonnes. 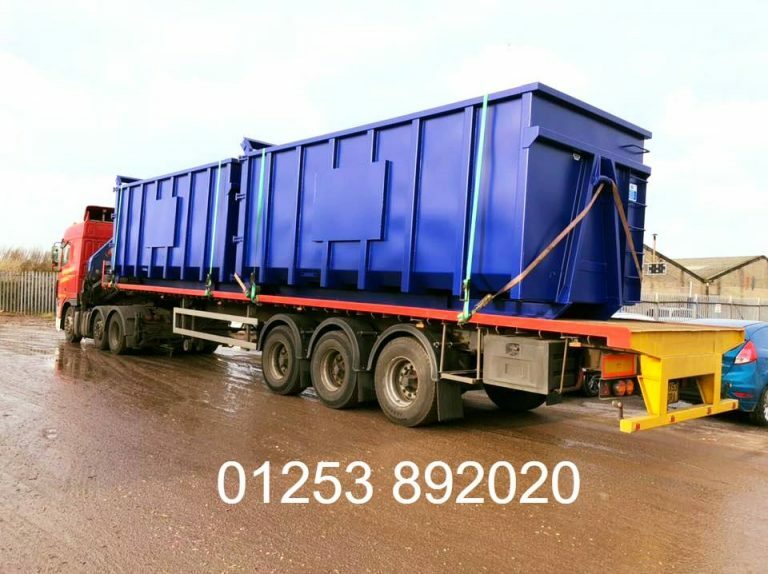 Ideal for bulky and light waste for commercial & construction clients or for light bulky waste. This container has a weight limit of 14 tonnes. Suitable for light builders waste and bulky wastes from strip outs and clearances. This container has a weight limit of 13 tonnes. Please note: We will call to confirm your date and time and to finalise your booking. The cost indicated below is your booking fee. This is not taken at this time. We will be in touch as soon as possible to finalize your order. Alternatively, you can call 01253 892 020 Monday to Saturday daytime.